On their wedding day, Kelly and Scott became their own team in Citizens Bank Park, home of the Philadelphia Phillies. Filled with excitement, the couple could not wait to get married in their favorite team’s home field. The sporty couple had their beautiful ceremony in the Phillies’ Hall of Fame. Before their big day, the two met in middle school and have known each other for sixteen years. They met as children and grew up together and into a wonderful couple. Kelly held back tears as she read her heartfelt vows to Scott, while Scott reminisced on their first meeting. 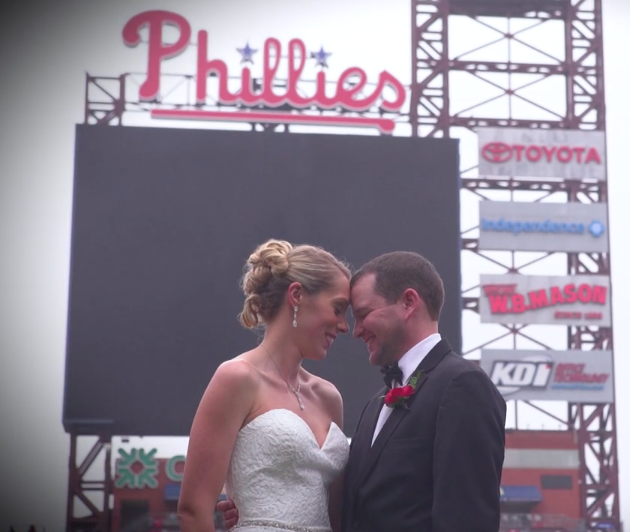 As soon as they were announced husband and wife, their guests cheered and waved Phillies rally towels to celebrate. After the ceremony, the party relocated to the Diamond Club for the reception. The baseball theme went into every detail of their wedding. Guests signed notes to the bride and groom on a replica of home plate and a baseball bat adorned the top of the wedding cake. The Phillie Phanatic even joined in on the fun to dance with guests and help Kelly and Scott celebrate their special day. Allure Films was able to film the unique ceremony and reception. We were even able to get some exclusive clips in the Phillies’ locker room. We wish the best of luck for the new team! Congratulations Kelly and Scott! Your wedding is one brief day in time, and although your vows are spoken in a matter of minutes, they are promises that will last a lifetime. This moment is the anchor that holds your past and your future together. Since it represents your public declaration of your love and marriage promises, it is important to be emotionally prepared. Throughout your relationship, you have been many things to one another – acquaintance, friend, companion, lover, dancing partner, and even teacher. And now, you get to add “spouse” to this ever-growing list. During your time together, you have both learned that good company and friendship count for more than wealth, looks, power, or position. You have realized that the journey of marriage is a path that is best gone through with a great companion. 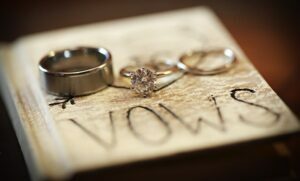 The symbolic vows that you make are a way of acknowledging every promise you have made and and every hope or dream you’ve shared, and those you will make and share together for years to come. It is always a nice touch when couples write their own vows. It’s the best way to bring personality into your wedding ceremony, and a great way to engage the audience. Expressing your love on paper may seem daunting, but it’s easier than you’d think. Take the time to consider the things you love about your partner and write down a few memories that come to mind. Think about the promises that you’ve made and include them in the vows. At the end, remember to include your goals, aspirations, and qualities you want to embrace as a couple in the future. Check Lauren and Tony’s unique custom vow exchange for some inspiration! Captured by Allure Films at the The Ashford Estate. Many couples choose to use standard wedding vows. Traditional marriage vows symbolize your love and commitment and show regard for a tradition or religion. They can also evokes a sense of respect to marriage as a sacred institution that deserves to be revered by your guest. This monumental moment will come and go quickly – make sure it is documented by a professional. At Allure Films, we understand this better than most. That’s why we take special care when capturing the sights and sounds of your big day. Contact Allure Films today for more information on our wedding videography packages!